Leaking hatchway doors are a nuisance for homeowners who'd like their crawl space to be dry. When you waterproof your crawl space, you'll want to be able to count on it to be dry -- and to stay dry from that point on. If your crawl space or basement is flooding from the stairs and hatchway entryway, then the job is not done. Keeping doors and stairways from flooding water into your home! Our solutions install quickly and are backed by a written lifetime warranty! To schedule your waterproofing quote free of charge and with NO obligation, contact us today! We serve throughout British Columbia, including Victoria, Nanaimo, Qualicum Beach and many surrounding areas nearby. 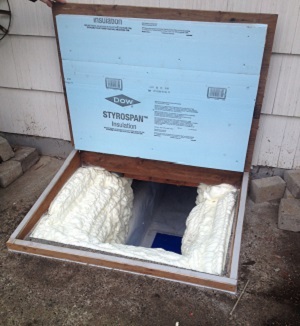 (Above) A hatchway entrance that is sealed and insulated to prevent water from leaking through. Because it's rare for this joining point to be sealed by the contractors, it is a major weak point where water can flood through to your crawl space or basement. Like any concrete structure, a hatchway entrance will begin to form cracks over time. Water will flood through these cracks, move to the stairs and end up flooding into your crawl space. Meant as part of a perimeter drain system, it's a great way to keep hatchway flooding out of the home, and away from your furniture and belongings. No matter how water is flooding into your home from the hatchway doors, our TrenchDrain™ Hatchway Door System is a great way to keep it out of your crawl space. We Can Stop Your Hatchway Door From Flooding Your Crawl Space! Whether your hatchway doors are leaking or you have some other flooding problem, your local waterproofing experts at Island Basement Systems have the solution you need. From leaky hatchways to flooding floors, iron ochre issues, wall cracks, or even ugly basement windows, we have it all! We'd like to meet with you and show how we can make your basement dry -- all the time! Contact us today to schedule your free waterproofing quote! We serve the British Columbia area, including Nanaimo, Saanich, Victoria and many nearby areas.